If you’re a Respiratory Therapy student, then you are definitely going to need to be familiar with heart attacks and how to treat patients that are demonstrating the most commons signs and symptoms. You must know this information not only for your tests in Respiratory Therapy school, but also for the TMC Exam (and Clinical Sims) as well. That is why we put together this study guide that is loaded with myocardial infarction practice questions that will teach you everything you need to know. So let’s dive in; are you ready? 1. What is the definition of a myocardial infarction? It is another name for heart attack. It is an acute blockage of the coronary arteries that results in ischemia and infarct of the heart muscle. 2. What is the chief complaint of a heart attack? Chest pain or chest pressure. 3. What are other symptoms of myocardial infarction? Nausea or vomiting, shortness of breath, and diaphoresis. 4. What are the risk factors of a myocardial infarction? Coronary artery disease, hypertension, high density lipoproteins, diabetes mellitus, smoker, family history or CAD (coronary artery disease) <55 years old, kidney history, sedentary lifestyle and obesity. This condition is twice as likely to occur in men as women. It has a highest prevalence in African American men ages 45 and older and for women 55 and older. 5. Heart attacks are diagnosed by what? EKG (STEMI) or elevated Troponin (non-STEMI). 6. What are medications for a heart attack? ASA, NTG, and thrombolytic (Heparin). 7. What are the incidences of myocardial infarction? Incidence decreases with higher socioeconomic status and less than 10 percent are fatal in US. 8. What are the causes of a myocardial infarction? Coronary atherosclerosis, artherosclerotic plaque where there is a large amount of fat or cholesterol in diet, coronary vasospasm, thrombosis, increased vasomotor tone, chest trauma (laceration or contusion), severe anemia and collagen vascular disease. Myocardial infarction is caused by the interruption of oxygen delivery to myocardial tissue causing ischemic injury. The coronary artery occlusion resulting in myocardial ischemia and may owe to atherothrombosis, resulting from atherosclerosis. 9. What diagnostic tools are used for a myocardial infarction? ECG is used to record the electrical activity of the heart via electrodes on the skin. Blood tests are done to assess the enzymes present in your blood. Other tests are chest x-rays, echocardiogram, angiogram (pictured) and exercise stress test (done after the heart attack). 10. What are the complications of a myocardial infarction? 11. What happens during the early stages of a myocardial infarction? 12. What happens during the later stages of a myocardial infarction? One or more arteries become completely blocked causing a heart attack and damage/death of heart tissue due to lack of blood flow and oxygen to the tissue. 13. What is the prognosis of a myocardial infarction? Survival rates have increased steadily since 1970. Blockage of the left side of the heart is more fatal. 14. What are the mortality rates for a myocardial infarction? 4.6% in hospital, 4.5% 6 months after and 5.8% after one year. 15. What are the symptoms of a myocardial infarction? Pain in the upper region (which is the chest to left shoulder to jaw), shortness of breath, sometimes vague to no symptoms, heart failure, and cardiac arrest. 16. What can be seen on the ECG of patients with a myocardial infarction? The ST segment is elevated above normal. 17. What is a stress test? It determines effectiveness or oxygen delivery to myocardial tissue. 18. What specific enzymes are released by dying muscle? Includes cardiac troponin and creatinine phosphokinase. 19. What is the early diagnosis of a myocardial infarction? Myoglobin as it binds to oxygen. 20. What population commonly has silent myocardial infarctions? Elderly, post-menopausal women and diabetics. 21. What is the Levine’s sign? Clenched right fist held over the chest to describe ischemic chest pain. 22. What is the EKG diagnosis of myocardial infarction? 2/3 of the following: ST-elevation or ST-depression, T wave inversion and Q-waves. 23. Why does the heart need the coronary arteries? The myocardium is too thick for diffusion to take place efficiently. It is a buildup of a fatty plaque in an artery that blocks and hardens the artery locally. 25. How long does it take for a plaque to form to a clinically significant level? 26. What is stable angina? Only takes place when the heart exerts itself. 27. What is angina pectoris? Pain in the chest on exertion. 28. What is unstable angina? Takes place when you are at rest or not due to a plaque that has ruptured but is still held to the artery wall. 29. What is a thrombosis? When a clot completely blocks a vessel. 30. What happens during a heart attack? When the heart muscle starves of oxygen downstream of a block and dies. 31. What does an angioplasty use to do its job? 32. What is an angiogram? A look at the coronary vessels under a live x-ray. It uses radioactive dye and x-rays to see where blockages are. 33. What is a stent? A mesh material that holds a squished plaque against the arterial wall allowing blood flow through the vessel. 35. What is mural thrombus? Blood that no longer pumps through the heart clots and eventually turns into a fibrous tissue. 36. When does instant death occur from a heart attack? It results when a heart attack softens the affected myocardium thus leads to a rupture of the heart wall itself. 37. What is a CABG (coronary artery bypass graft)? Uses other veins or arteries and open heart surgery to restore blood flow to the heart muscle. 38. What is the other name for a heart attack? 39. 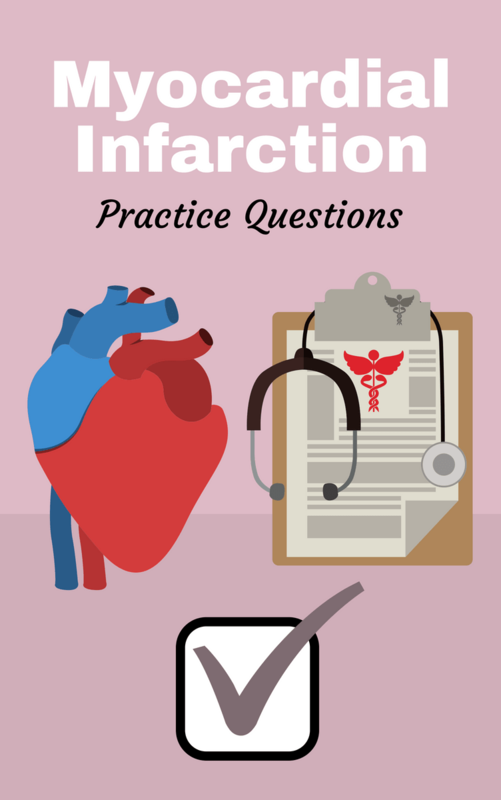 What is an infarction? Necrosis (tissue death) from lack of blood supply. 40. What do coronary thrombosis and vascular spasms cause? It causes a complete block of part of the coronary circulation and death of cardiac muscle cells beyond the blockage. 41. What does the severity of the heart attack depend on? Depends on the site and nature of blockage. It is a disease where there is a formation of intimal plaques in medium to large-sized (coronary) arteries. It leads to endothelial dysfunction where there is damage to endothelium resulting in reduced eNO release, promotes lipid adhesion (heparan sulfate) and accumulation and oxidation of LDLs (oxLDLs) – less serum antioxidants and more ROS. 43. What causes endothelial damage? Atherogenic diet that is high in saturated fats and/or salt, hypercholesterolemia; genetics such as familial hypercholesterolemia (mutation in apolipoprotein b100 or polygenic) which is a dysfunctional cholesterol metabolism; hypertension where there is a disturbed shear blood flow, more apoptosis and ROS production, more endothelin-1, less eNOS expression; smoking that leads to increased ROS; and, diabetes with hyperglycemia, increased NFkB, and increased adhesion molecules. 44. How does aspirin help to treat a heart attack? Irreversibly inactivates cyclooxygenase-1 (COX-1) thus blocking the production of thromboxane A2, used as an antiplatelet drug. 45. What are the symptoms of a heart attack? They are random chest pains, weakness, nausea, and basically anything else. 46. What is an EKG? EKG stands for electrocardiogram and is used to look for heart damage to determine what phase the heart attack is at. 47. What is an echocardiogram? It is used to view abnormalities in the heart walls motion patterns. 48. What is the most common cause of a heart attack? A blood clot that blocks one of the coronary arteries. 49. What causes a blood clot? Plaque built up that blocks the vessel entirely. Plaque breaks off and flows downstream. Plaque can tear that causes platelets to form a blood clot. 50. What is plaque made up of? 51. What happens when the plaque inside a blood vessel tears? Platelets form blood clots at the sight of the tear and this blocks the vessel. 52. When can a heart attack occur? When you are resting or asleep, a sudden exertion of physical activity, outside in cold weather and physical or emotional stress including an illness. 53. What are the normal CPK (creatine phosphokinase) levels? 10-120 mcg /liter of blood. 54. What level of CKP indicates a heart attack? 400-800 mcg /liter of blood. 55. What causes heart tissue to die at a faster than normal rate? Blood clots in the coronary arteries. 56. What is the job of the coronary arteries? To provide the heart muscles with oxygenated blood. 57. What are the phases of a heart attack? Hyperacute phase, fully enveloped phase, resolution phase, and permanent phase. 58. What is the fully enveloped phase? Appears a few hours to days after the heart attack. 59. What is the resolution phase? Appears weeks after the heart attack. 60. What is the stabilized chronic phase? Last phase, shoes permanent changes compared to a normal EKG. 61. What is the hyperacute phase? Happens directly after a heart attack. 62. As a Respiratory Therapist, when a patient presents with signs of a heart attack, what’s the first thing we should do? Give the patient 100% oxygen. 63. How fast do CKP levels rise? 64. What is the normal level of white blood cells? 4,000-10,000 ( 7,000 avg ). 65. What level of white blood cells indicates a heart attack? 66. How often do they do the CKP blood test? Every hour for 24 hours. 67. Why is it important to check the CKP levels often? If they keep rising patients are still having heart tissue die. 68. What is the immediate treatment for a heart attack? Intravascular Line (IV), blood thinners like aspirin, heart monitor and oxygen mask. 69. When will they use electric shock (defibrillator)? When the patient has a heart arrhythmia with a shockable pulse. 70. What chemical is used to relax the blood vessels? 71. What is coronary artery disease? The atherosclerotic narrowing of the coronary arteries. 72. What is the definition of arteriosclerosis? The loss of elasticity of the blood vessels and the narrowing of the vessels due to fatty deposits. 73. What can plaque lead to in coronary artery disease? 74. What is the mortality rate for cardiovascular disease? 39.4% or 1 out of every 2.5 deaths in the US. 75. What are the risk factors for coronary artery disease? Smoking, hyperlipidemia, diabetes mellitus, obesity, sedentary and uncontrollable stress. 76. What are the entrance criteria for metabolic syndrome? Hypertension, abdominal obesity, and pre-diabetic. 77. What are the risk factors for AMI (acute myocardial infarction)? Smoking, hypertension, genes, and obesity. 78. What decreases the risk for AMI? No smoking, healthy eating, exercise, and moderate alcohol. 79. How does plaque form? LDL (low-density lipoprotein cholesterol) enters and oxidizes. Monocytes adhere and cross intima becoming macrophages. Macrophages eat fat and become foam cells. Muscle cells multiply and enter intima. Muscle cells die and harden plaque. Calcium develops. So there you have it! I really hope that this study guide was helpful for you. I’m pretty confident that if you study these myocardial infarction practice questions and go through them over and over again, you can easily learn what’s required for you to know about heart attack patients and more. Thanks for reading, I wish you the best of luck, and as always, breathe easy my friend.